The new website brings together the two brands with the message – TWO BRANDS. 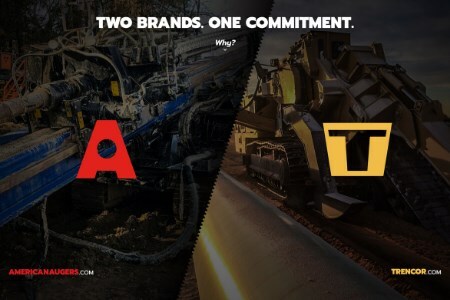 ONE COMMITMENT – and clarifies how American Augers/Trencor has their customers’ back. The slick design of the mobile-responsive website makes it easy for visitors to navigate between the two brands and access detailed product specifications, as well as information and registration for training, warranty, support manuals, parts sales, dealers and reps, and team contacts. American Augers builds the largest category of horizontal directional drills in the industry and a full range of Auger Boring machines. Developed and hand-crafted in the US, with the rugged user in mind, American Augers rigs are built to last and backed with 24 hr worldwide support. American Augers is a member of the family of companies that comprise Charles Machine Works. Each focused on meeting the needs of the underground construction industry, they include Ditch Witch®, Subsite® Electronics, DW/TXS®, HammerHead®, Radius® HDD, American Augers®, Trencor® and MTI® Equipment.